Acne vulgaris (or simply acne) is a common human skin disease, characterized by areas of skin with seborrhea, comedones, papules, nodules, pimples, and possibly scarring. Acne affects mostly skin with the densest population of sebaceous follicles; these areas include the face, the upper part of the chest, and the back. Acne where infections are deep under the skin and do not raise to the surface of skin is called severe nodular acne or cystic acne. Cystic acne heals very slowly as infection waste material is not discharged. People with nodules or cysts should be treated by a dermatologist. For patients with severe inflammatory acne that does not improve with medicines such as severe nodular or cystic acne, a doctor may prescribe isotretinoin, a retinoid. Isotretinoin is an oral drug that is usually taken once or twice a day with food for 15 to 20 weeks. It markedly reduces the size of the oil glands so that much less oil is produced. As a result, the growth of bacteria is decreased. 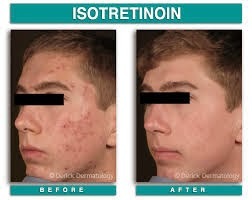 Isotretinoin is a very effective medicine that can help prevent scarring. After 15 to 20 weeks of treatment with isotretinoin, acne completely or almost completely goes away in up to 90 percent of patients. In those patients where acne recurs after a course of isotretinoin, the doctor may institute another course of the same treatment or prescribe other medicines. Isotretinoin can cause birth defects in the developing fetus of a pregnant woman. It is important that women of childbearing age are not pregnant and do not get pregnant while taking this medicine. Women must use two separate effective forms of birth control at the same time for 1 month before treatment begins, during the entire course of treatment, and for 1 full month after stopping the drug. They should ask their doctor when it is safe to get pregnant after they have stopped taking Accutane. Some people with acne become depressed by the changes in the appearance of their skin. Changes in mental health may be intensified during treatment or soon after completing a course of medicines. A doctor should be consulted if a person feels unusually sad or has other symptoms of depression, such as loss of appetite or trouble concentrating. Other possible side effects include dry eyes, mouth, lips, nose, or skin; itching; nosebleeds; muscle aches; sensitivity to the sun; and, sometimes, poor night vision. More serious side effects include changes in the blood, such as an increase in triglycerides and cholesterol, or a change in liver function. To make sure Accutane is stopped if side effects occur, the doctor monitors blood studies that are done before treatment is started and periodically during treatment. Side effects usually go away after the medicine is stopped.